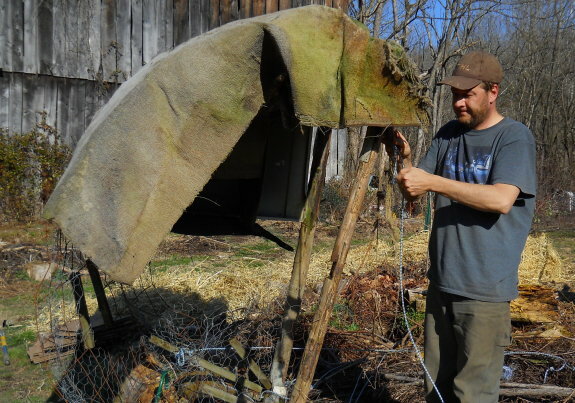 I finally got around to taking apart another one of our chicken tractors that we stopped using in favor of small pastures we can rotate the flock through. The old carpet we used for the roof and walls is still holding strong after 6 years of exposure to the elements. Makes me wonder if salvaged carpet could work for other projects like this? How did the carpet work at keeping water out? I've been looking for a good solution to closing up the top of my A-frame chicken coop roof that swings open from the bottom on one side. I was wondering if old Carpeting might be used to cover and insulate buried food chaches? Or do you think the mold factor might cause more harm then good? Jessie --- The carpet actually did quite a good job of giving them a dry perch. I'd say it's more water resistant than water proof, and if there was an extended downpour there might have been a drip or two. But as long as the carpet is at an angle so the water wants to flow off, it keeps whatever's under it pretty dry. Mona --- Interesting use for old carpets! I'm not sure if it would keep the food dry enough since it wouldn't be at an angle, but it would be worth a shot. We've also used carpets as a removable kill mulch to kill weeds in an area we want to plant later.